Enjoy the vibrant buzz of London and all it has to offer using the London Heliport to travel by helicopter and escape the drawback of traffic. Enjoy the experience of arriving in London refreshed and ready for business or to enjoy a day of leisure, having arrived via the London Heliport, located on the south bank of the River Thames. You will further enhance your travelling experience by flying over the River Thames as you arrive or take off from the London Heliport. Save time and fly over those stuck in traffic jams, using the London Heliport to get you closer to your destination so you enjoy your time more productively in the UK capital. You will avoid being late by escaping the infamous travel problems associated with the South and South East of England as well as enjoying the comfort that goes with using a helicopter. As an important centre for business and a world financial capital London hosts many important business meetings and conferences. The London Heliport is often used as a gateway to and from London. By using the London Heliport you are able to access the capital or to link with waiting jets as well as hotels and sporting venues which have helipads; you will be able to get to where you want to be when you want to be there. Access London quickly and in comfort by using the London Heliport as a link to the many satellite London airports, such as Biggin Hill, Farnborough or Luton, saving you time, getting to your destination quickly and efficiently. The London Heliport caters for all helicopter types from 7.00 am to 10:45 pm 7 days a week. 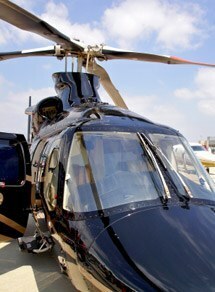 With transfer times between the many satellite airports and London Heliport between 10 and 20 minutes, helicopter transfers to and from London have become very popular. The London Heliport provides refuelling services for those looking to fly longer journeys in a helicopter as well as parking for cars to meet your helicopter and take you to your destination in London by road. Using a helicopter and benefiting from the location of London Heliport means you will never have to worry about being late, whether you are going to the Theatre or a business meeting. Please phone our team on 01256 635000 to discuss hiring a helicopter and using London Heliport to solve your transport problems with one call.